Few vehicles are better off road than a Jeep Wrangler. This is the one that started it all. Traceable to the original Jeep, the Wrangler is the very symbol of off-road capability. The Wrangler is offered in the familiar two-door version and a four-door model, known as the Unlimited. The four-door doesn't change the character of the Wrangler but makes it more practical for many. It's much more comfortable and convenient, offering more cargo and rear-seat passenger space. Still, the traditional two-door Wrangler has its charms, and we enjoy all of them. The 2010 Wrangler has only minor changes, including a couple of new colors and some minor feature enhancements. There's an improved Sunrider soft-top that is easier to remove, Sahara and Rubicon models have new alloy wheels, fog lamps and tow hooks are now standard on all models, the base Sport models now have cloth upholstery, and there are other detail refinements. The Wrangler is available in a very wide range of models and trim levels and with an extensive array of optional equipment and features. All Wranglers have a 3.8-liter V6 engine; there is no four-cylinder engine available. The standard six-speed manual fits the Wrangler's personality, but the optional four-speed automatic is more convenient. 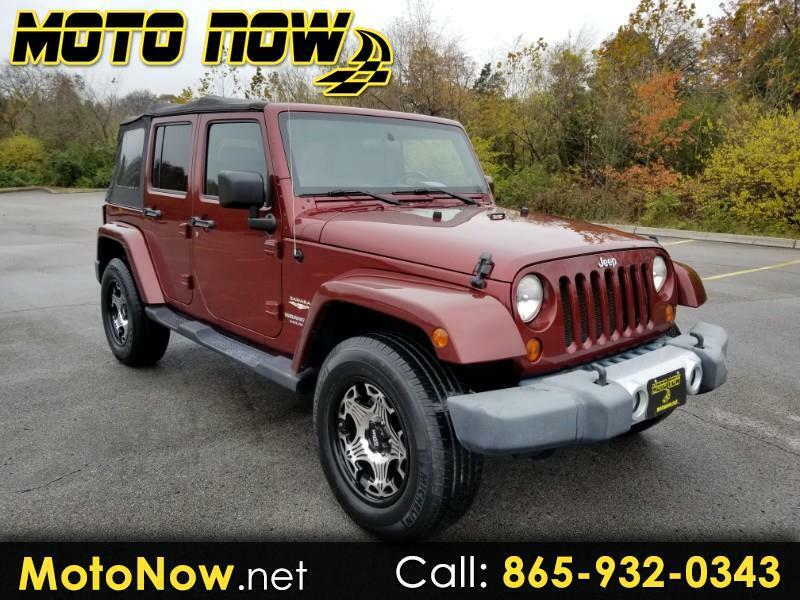 We can't imagine getting a Wrangler without the highly capable four-wheel-drive, a part-time system that includes low-range gearing, but there are two-wheel-drive Unlimited models available. 2010 Jeep Wrangler and four-door Wrangler Unlimited are offered in Sport, Sahara and Rubicon trim. In all versions, the 3.8-liter V6 engine develops 202 horsepower and 237 pound-feet of torque. Four-wheel disc brakes with ABS are standard. A four-speed automatic transmission is optional ($825). All two-door models come with four-wheel drive (4WD). The Unlimited Sport and Unlimited Sahara are available with rear-wheel drive (2WD) or 4WD. Unlimited Rubicon models come standard with four-wheel drive. The Sport ($21,165) comes with the basic soft top, cloth upholstery, center console, theft deterrent system, folding rear seat, locking glove box, 12-volt auxiliary power outlet, tilt steering wheel, six-speaker AM/FM/CD stereo, skid plates to protect the transfer case and fuel tank, and P225/75R16 all-terrain tires on steel wheels. Options include air conditioning ($895), a Black Appearance Group ($685), a Chrome Edition Group ($920), a 3.73:1 axle ratio ($50) instead of the standard ratio of 3.21.1, a limited-slip differential ($295), the Dual Top Group ($1,625), Sirius Satellite Radio ( $195), tubular side steps ($395), Infinity sound system ($395), front seat-mounted side airbags ($490), tinted windows ($300), the Power Convenience Group (power windows, power door locks, and remote keyless entry ($585), an AM/FM six-disc in-dash DVD/MP3 player ($350), and trailer towing ($320). Various option groups include P255/75R17 tires on alloy wheels. The Wrangler Sahara ($26,255) adds a height-adjustable driver's seat, front-seat map pockets, monotube shock absorbers, air conditioning, Infinity sound system, and P255/70 R18 tires on machined alloy rims. The Wrangler Rubicon ($28,775) is the model for serious off-roading. To the Sahara, it adds an electronic-disconnecting front anti-roll bar, the Rock-Trac heavy-duty transfer case, a heavy-duty front axle, Tru-Lok electronic locking front and rear differentials, a 4:10 axle ratio, rock rails and other equipment intended for the serious off-roader. The Rubicon is also available with the same options as the other models. The four-door Unlimited Sport has either 2WD ($23,410) or 4WD ($24,585). Standard equipment includes all that the two-door offers, plus height-adjustable driver's seat, split-folding rear seat, Sunrider soft top, heavier-duty Dana 44 rear axle, 22.5-gallon fuel tank, and air conditioning. The Unlimited Sahara 2WD ($27,730) and 4WD ($28,905) are equipped like the two-door Sahara, except power door locks, power windows and remote keyless entry are standard. Options offered on the two-door models of Sport and Sahara are also available on the four-door Unlimited models. Visit Moto Now online at www.motonow.net to see more pictures of this vehicle or call us at 865-579-2730 today to schedule your test drive. AS IS - NO WARRANTY YOU WILL PAY ALL COSTS FOR ANY REPAIRS. The dealer assumes no responsibility for any repairs regardless of any oral statements about the vehicle. Message: Thought you might be interested in this 2010 Jeep Wrangler.